Brazil warmed up for next month’s Rio Carnival with spectacular block parties as revellers took to the streets in preparation for the grandest celebration in the country. 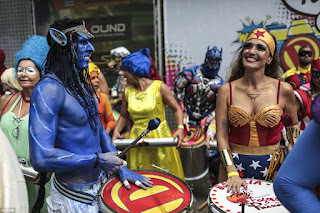 Samba dancers, elaborate costumes and lots of feathers and glitter could be seen as delighted revellers took to the streets for the pre-Carnival Banda de Ipanema ‘bloco’, or block party. Some people even went Private, covering themselves with paint as they celebrated on January 27. There were fears that this year’s Carnival in Rio De Janeiro could be delayed or hampered. These worries were based on a significant funding cut from Rio’s new Evangelical mayor.